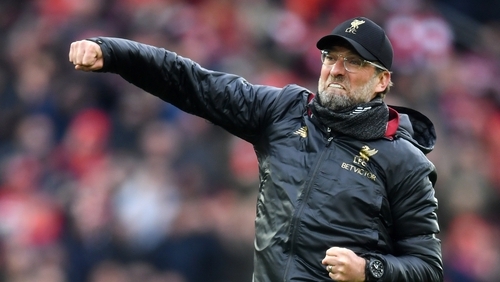 There was no sign of past traumas affecting Liverpool as they dealt with the toughest challenge of their title run-in to beat Chelsea 2-0 at Anfield on Sunday. Five years ago it was an April defeat at home to the West London side which prompted a late season collapse as Liverpool let the Premier League title, they have craved since 1990, slither out of their hands. A slip from Steven Gerrard and a goal from Demba Ba gave Chelsea the opening goal and became a part of footballing folklore -- as the visiting Chelsea fans could not resist reminding their opponents of in song, on Sunday. But while that annoyed the Kop, there was not the slightest hint of that recollection having any impact on the Liverpool players. There was, for a brief moment, a hint of deja-vu when Liverpool full-back Andy Robertson slipped on the half-way line in the second-half, but the Chelsea break was snuffed out by Liverpool's much improved defence. "We can finally close the slipping book," said Klopp, "Robbo slipped and nothing happened. It is not a Liverpool thing." This is, of course, a very different Liverpool side and one which shows no sign of letting nerves get the better of them. "Five years ago didn’t matter today," said Liverpool defender Virgil van Dijk. "They were very disappointed back then but today was a very different game. We showed great things during the game and we are very happy with the three points." The only Liverpool survivor from that 2014 game was Daniel Sturridge, who on Sunday was an unused substitute, although current skipper Jordan Henderson was part of Brendan Rodgers' squad that season. That was a squad that followed up the Chelsea defeat by letting a three goal lead dissipate in the final 11 minutes at Crystal Palace -- Manchester City winning the title by two points on the final day. Liverpool, who lead by two points, must take care of their business and hope that Tottenham or Manchester United can stop rivals City from picking up maximum points from their remaining five games. "The first question in the meeting today was 'what is the City score? You cannot avoid knowing about it. But it isn’t interesting to us," he said. "We expect them to win all their games so we just need to get as many points as possible and if we’re champions then great but if not (we are) still a really good football team."